Logan Guleff, Cook Nook Columnist, has been named one of the Most Influential Teens by Time Magazine and a James Beard Blended Burger Winner. 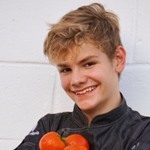 Since becoming the 2014 MasterChef Junior champion he has become a rising star in the culinary world. He was named Southern Living‘s Best New Southern Cook and earned a spot on Fortune Magazine’s 18 Under 18 list; he’s also the youngest certified judge for the World Championship Barbecue Cooking Contest in Memphis, Tennessee, and the youngest chef to cook at the historic James Beard House in New York City. He has judged the International Young Chef Olympiad in India and has launched his first cook, “Logan’s Chef Notes and Half Baked Tales”, which won Gourmand’s Best in World for first cookbook. He has also given a TEDx talk on the “The Art of the Flavor”.